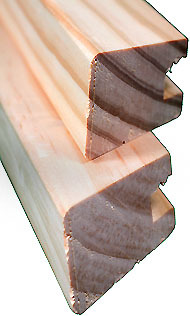 InkjetPro stretcher bars are kiln dried and finger jointed, made from regrowth timber, in both long lengths for framers and pre-cut fit together sizes for customers without framing equipment. Unlike sharp edged art bars these bars are made for inkjet printing with no waste sizes and rounded edges for the elimination of canvas cracking. 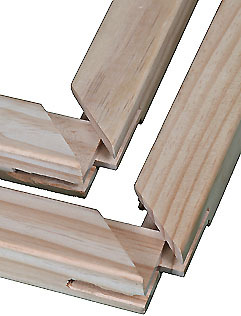 For standard work order InkjetPro Standard bar in either long lengths or premade sizes with tongue and groove ends that fit together snuggly to form the corner. InkjetPro bars are available in a variety of profiles. GMS InkjetPro stretcher bars do not use Australian hardwood timber (Eucalypts such as Vic Ash or Tassie Oak) or non-regrowth Asian rainforest timber (Meranti). Many of these products contain larger amounts of tannin or tannic acid, which may be detrimental to archival (acid free) products. In addition to the acidic content issue, the use of non regrowth forest contributes to global warming and climate change. All GMS products are marked as originating from regrowth forests.